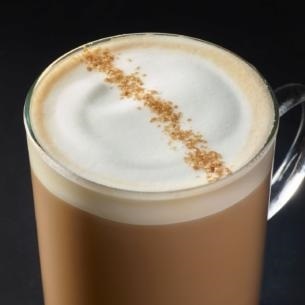 Try our popular Cascara Latte with this update: steamed coconutmilk. When combined with our signature espresso and the delicate, dark brown sugar and maple notes of cascara (made from the fruit of the coffee cherry) the result is a drink that's luscious and subtly sweet. COCONUT MILK [WATER, COCONUT CREAM, CANE SUGAR, TRICALCIUM PHOSPHATE, COCONUT WATER CONCENTRATE, NATURAL FLAVORS, SEA SALT, CARRAGEENAN, GELLAN GUM, CORN DEXTRIN, XANTHAN GUM, GUAR GUM, VITAMIN A PALMITATE, VITAMIN D2 (ERGOCALCIFEROL)], BREWED ESPRESSO, CASCARA SYRUP [WATER, CANE SUGAR, COFFEE CHERRY EXTRACT, ORGANIC COCONUT SUGAR, CITRIC ACID, XANTHAN GUM, POTASSIUM SORBATE], CASCARA TOPPING [SUGAR, COFFEE CHERRY EXTRACT].